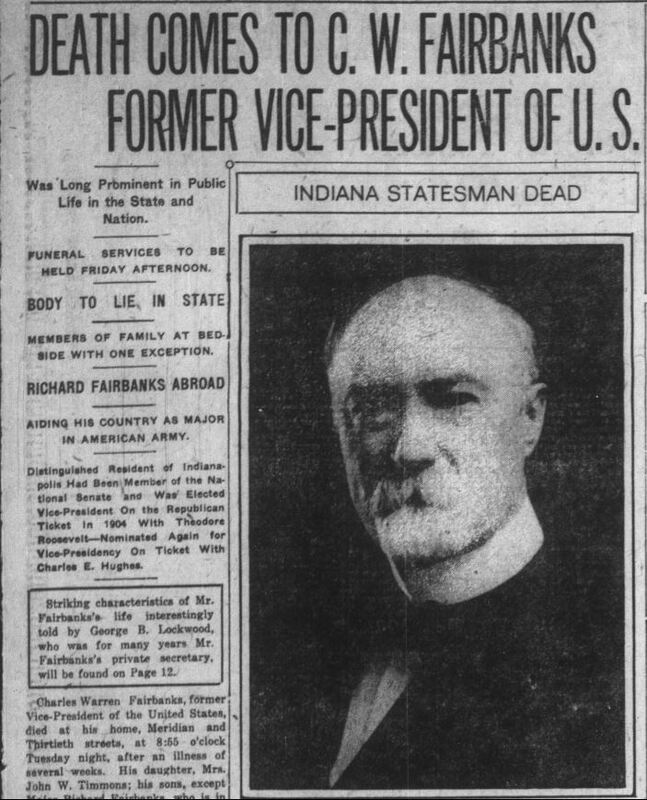 On this day in 1918, former Vice President Charles W. Fairbanks died. He served as vice president under Theodore Roosevelt from 1905-1909. 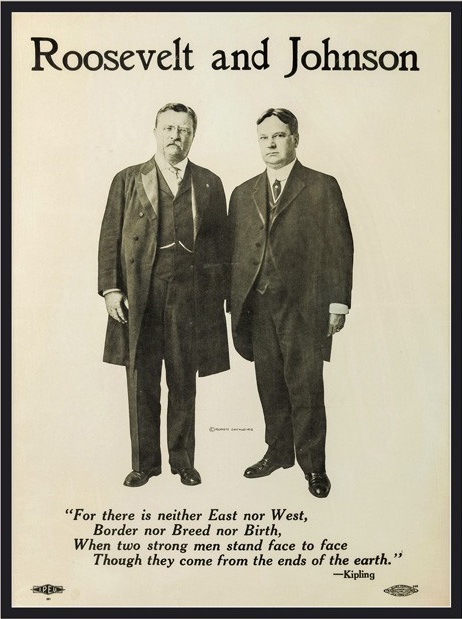 He also ran as Charles Evans Hughes’s running mate in the 1916 election (they were defeated by Woodrow Wilson and another Hoosier running mate, Thomas Marshall). 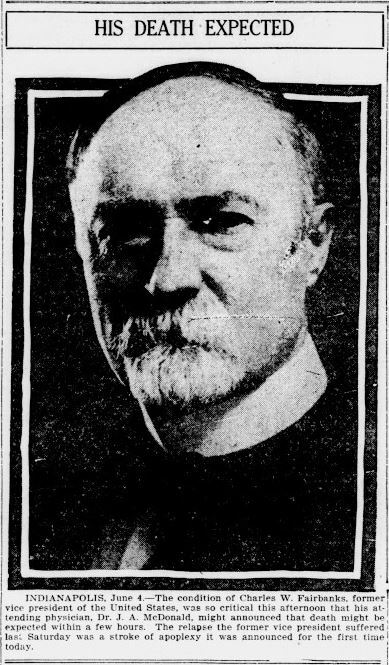 Lake County Times, June 5, 1918. Hoosier State Chronicles. 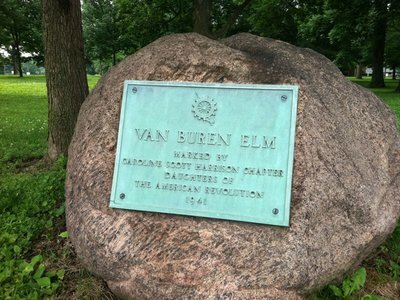 Born in Ohio in 1852, he settled in Indianapolis with his wife in 1874. 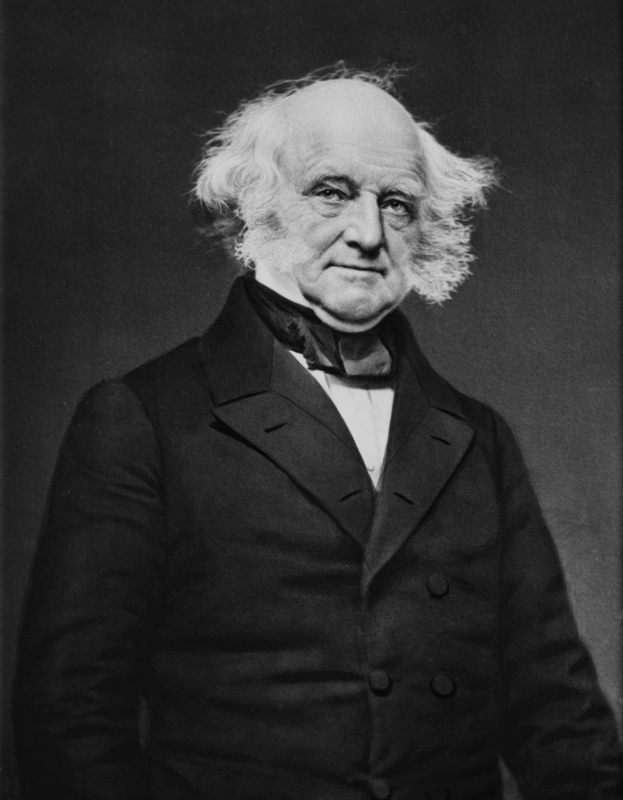 It was in Indiana that he used his considerable wealth from practicing law and his political acumen to lead the Republican party to victories in numerous elections. In the 1896 election, he served as a key campaign adviser for William McKinley’s presidential run, helping lead it to victory. His success as party leader also ensured a Republican-majority in the Indiana General Assembly, which in turn elected him to the US Senate (State legislatures chose U.S. Senators before the ratification of the 17th Amendment in 1913), a position he held until he was sworn in as vice president on March 3, 1905. Due to personal and ideological differences, Fairbanks found himself isolated in Roosevelt’s administration. South Bend News-Times, June 5 1918. Hoosier State Chronicles. 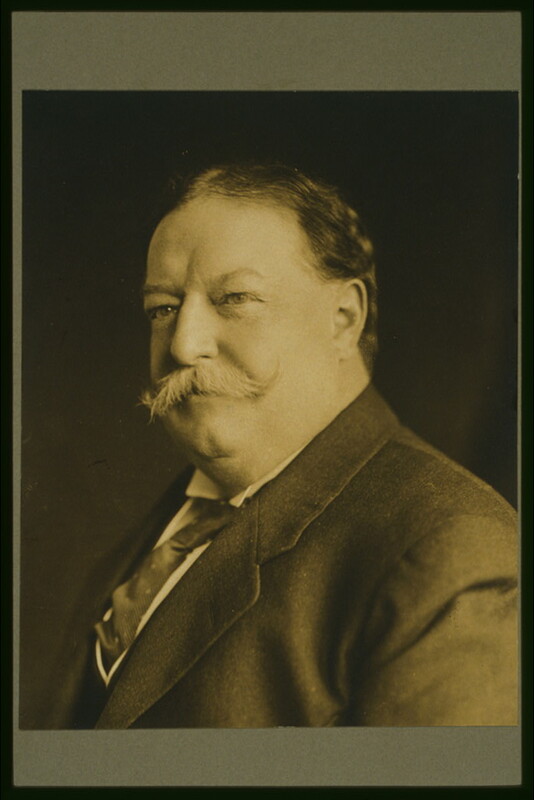 While a serious contender for the Republican presidential nomination in 1908, his prospects ended when the party chose Roosevelt’s hand-picked successor, then Secretary of War William Howard Taft. 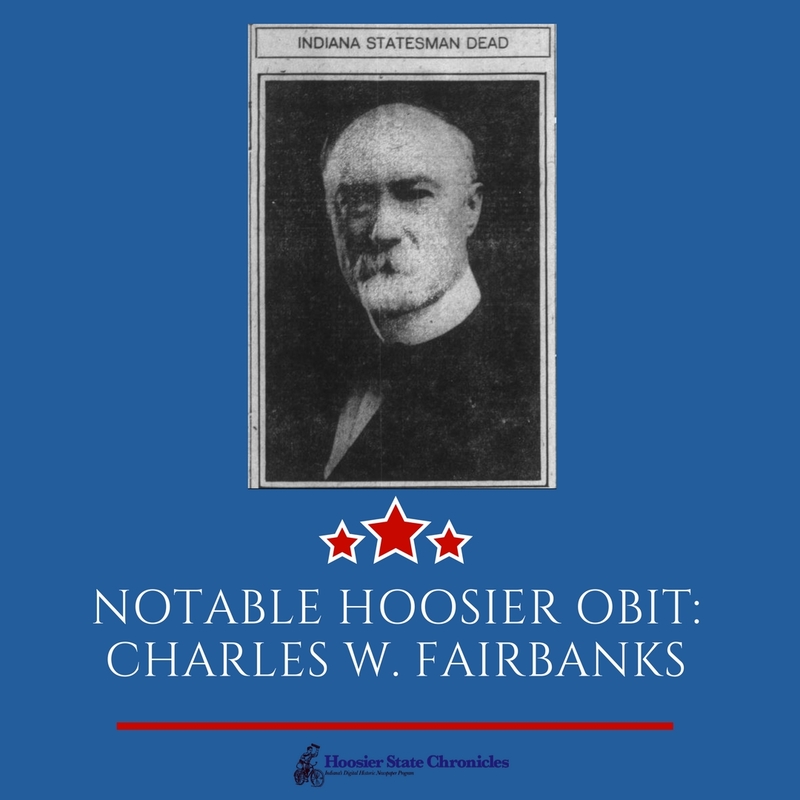 In 1909, he retired to Indiana and again pursued his law practice, only throwing his hat in the ring one last time in the aforementioned 1916 election. Richmond Palladium, June 4, 1918. Hoosier State Chronicles. Indianapolis News, June 5. 1918. Hoosier State Chronicles. His love of his native state was noteworthy. 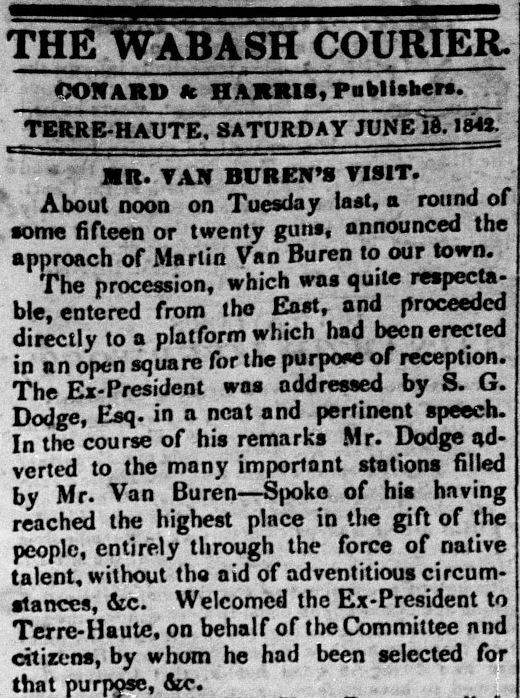 When he left the office of Vice-President his first thought was of doing something that would be of permanent value to Indiana, and at the same time would be an example for the nation. His active and greatly beneficial efforts for forestry development was the result. He was a real man of high and noble Ideals. His statecraft made him a country-wide figure In public affairs, and his distinguished presence, hie fine courtesy and his safe counsel will be missed by his friends, his party and his country. To learn more about Fairbanks, visit these biographies by the Miller Center and the US Senate. To read the Collier’s article, click here. 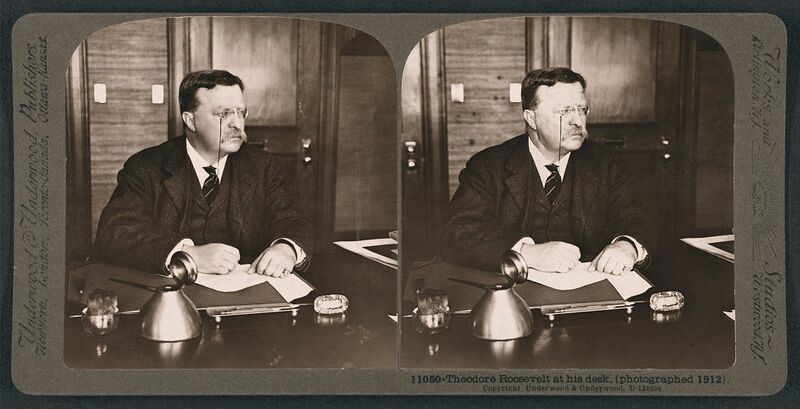 Theodore Roosevelt at his desk, 1912. Courtesy of the Library of Congress. This election year, there has been a lot of talk of third-party candidates, like Gary Johnson and Jill Stein. However, this election cycle is hardly the first to celebrate third-party candidates for President. American presidential history is rich with third-party candidates, such as Ross Perot’s 1992 campaign against Bill Clinton and George H.W. Bush or Ralph Nader’s Green Party candidacy in 2000. From the Hoosier state there was Eugene V. Debs, the Socialist Party candidate who received nearly a million votes in the 1912 election. Yet, it is arguable that the most successful third-party run for the presidency was by someone who had already been president. Theodore Roosevelt in Hackensack, New Jersey, 1912. Courtesy of the Library of Congress. President William Howard Taft, circa 1909. Courtesy of the Library of Congress. Roosevelt’s decision to run stemmed from his disappointment at the cautiousness and conservatism of his former cabinet member and hand-picked successor, William Howard Taft. Taft came into office in 1909 arguing for Roosevelt’s ideals, but had since moved towards to the limited government and pro-business attitudes of Republican Party insiders, or so Roosevelt believed. It was this disappointment which motivated Roosevelt to usurp the Republican nomination from Taft and reassert his influence on the party. When the Republicans rejected him in favor of Taft in June of 1912, Roosevelt vowed to begin a new party. Thus, the Progressive Party was born. 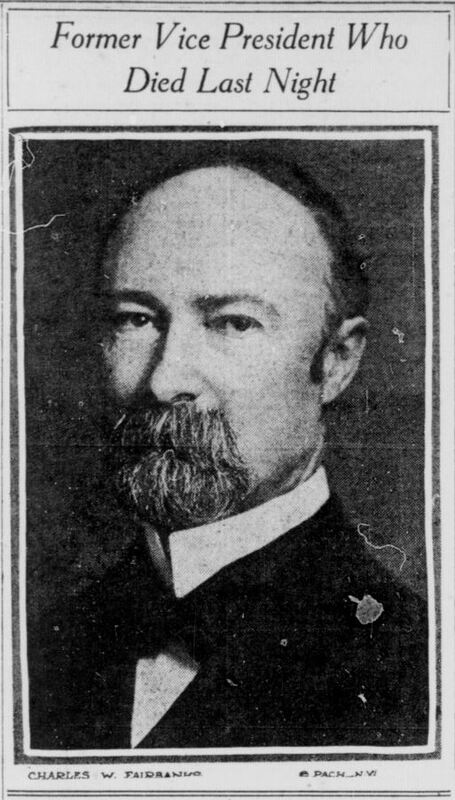 Rudolph G. Leeds, editor and publisher of the Richmond Palladium and Sun-Telegram. He was an enthusiastic supporter of Roosevelt’s 1912 campaign. Courtesy of harfam.org. 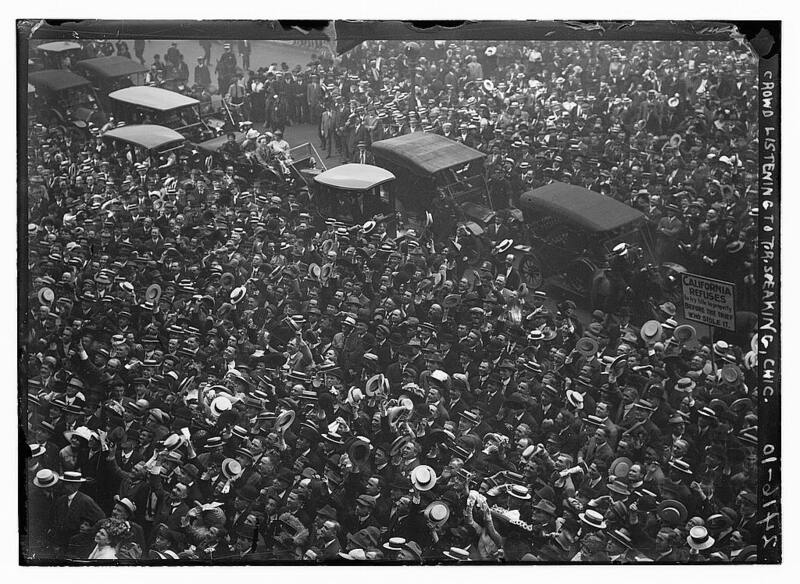 A crowd listening to Roosevelt speak in Chicago, 1912. Courtesy of the Library of Congress. 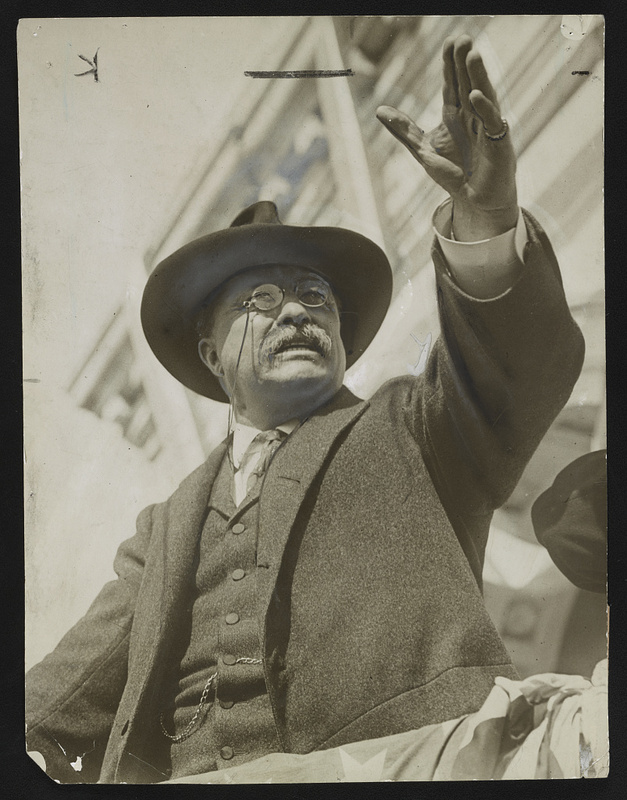 The next day, August 6, Roosevelt announced his contention for the party’s presidential nomination. His running mate was Hiram W. Johnson, senator from California and one of the Progressive Party’s founders. In his speech, known as the “Confession of Faith,” Roosevelt reiterated his position from his remarks the day before. “Our fight,” Roosevelt declared, “is a fundamental fight against both of the old corrupt party machines, for both are under the dominion of the plunder league of the professional politicians who are controlled and sustained by the great beneficiaries of privilege and reaction.” In terms of policy, Roosevelt argued for more workplace and wage protections for labor, further regulations of trusts and large corporations, assistance to farmers, and wilderness conservation. 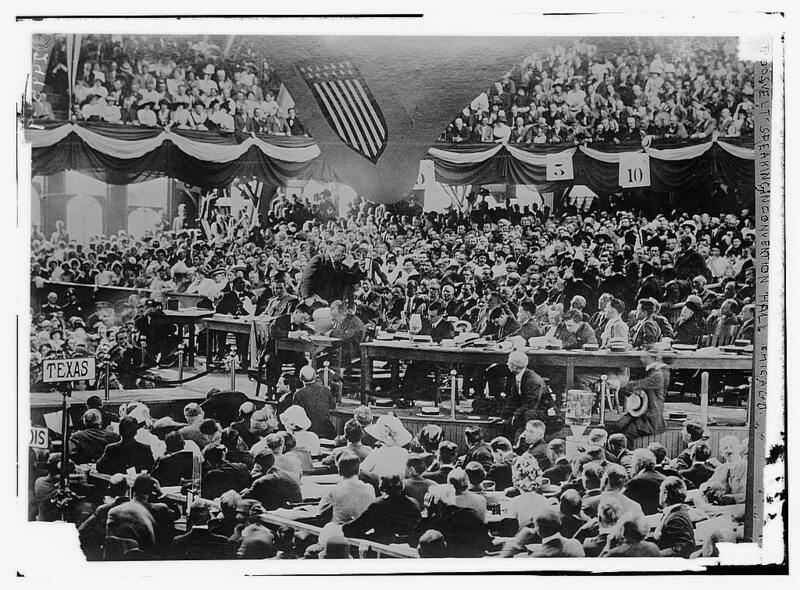 Theodore Roosevelt speaking to Progressive Party delegates at their national convention, August 1912. Courtesy of the Library of Congress. Now to you men, who, in your turn, have come together to spend and be spent in the endless crusade against wrong, to you who face the future resolute and confident, to you who strive in a spirit of brotherhood for the betterment of our nation, to you who gird yourselves for this great new fight in the never-ending warfare for the good of humankind, I say in closing…We stand at Armageddon, and we battle for the Lord. A positive editorial on the Progressive Party by the Richmond Palladium and Sun-Telegram, August 7, 1912. Courtesy of the Indiana State Library. Theodore Roosevelt and his Progressive Party running mate, Hiram Johnson, 1912. Courtesy of the New York Times. However, Roosevelt’s dedication to a “square deal” under the Progressive Party banner left a key demographic from being at the table: African Americans. As historian Eric J. Yellin observed, Roosevelt staked his political future on alienating the African American voters in the south, who he thought he had already lost to Taft. Due to this misnomer, Roosevelt sought to create a “shadow Republican Party in the south made up of lily-white organizations.” This resulted in the rejection of southern African American delegates from the Progressive Party convention. An editorial in the Indianapolis Recorder, August 24, 1912. 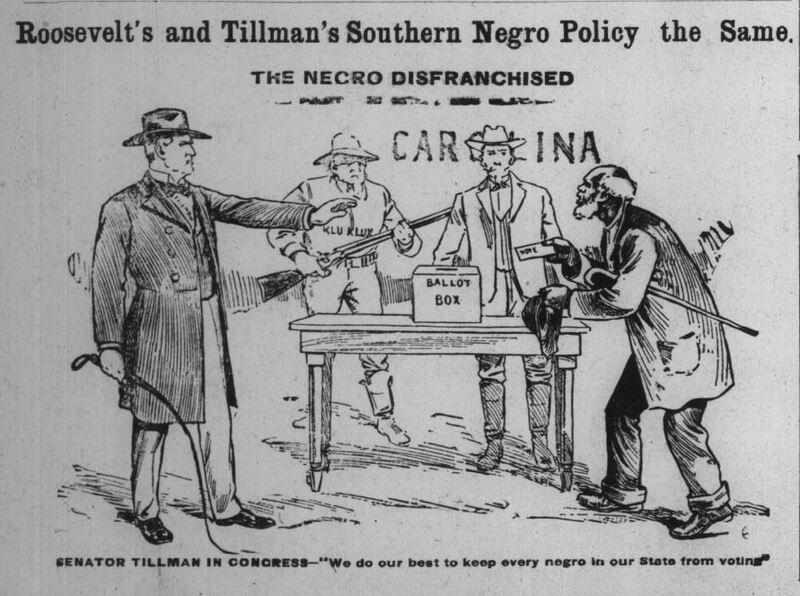 It linked Roosevelt’s alienation of black voters with the segregationist policies of Senator Benjamin Tillman (even though Roosevelt disliked him). Courtesy of Hoosier State Chronicles. 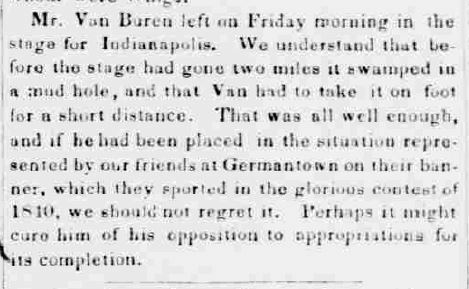 A scathing editorial of Roosevelt’s “southern strategy” by the Indianapolis Recorder. Courtesy of Hoosier State Chronicles. Bishop Reverdy C. Ransom. 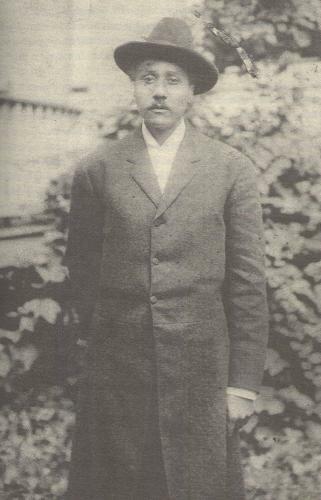 The AME leader left Roosevelt and the Progressive Party after their disenfanchisement of southern African-Americans. Courtesy of blackpast.org. 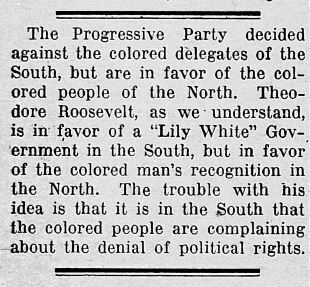 The Progressive Party decided against the colored delegates of the South, but are in favor of the colored people of the North. 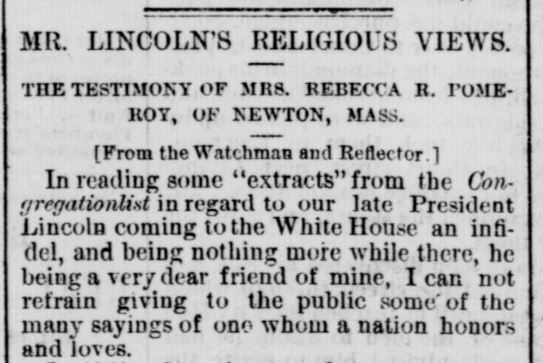 Theodore Roosevelt, as we understand, is in favor of a “Lily White” Government in the South, but in favor of the colored man’s recognition in the North. The trouble with his idea is that it is in the South that the colored people are complaining about the denial of political rights. The Greenfield Republican, August 8, 1912. Courtesy of Hoosier State Chronicles. 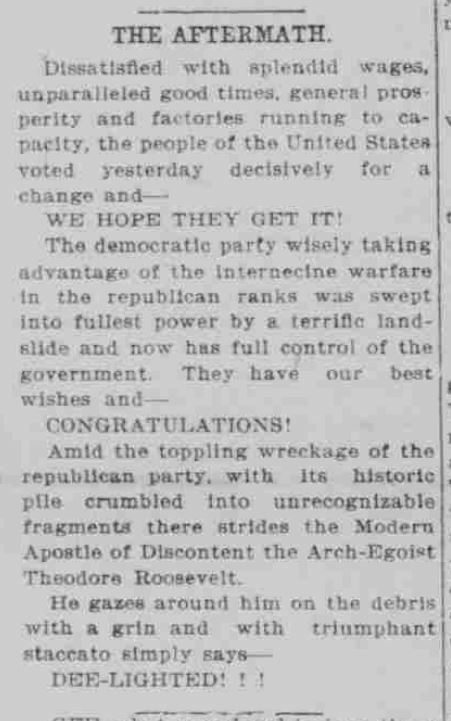 This observation highlighted Roosevelt’s central electoral gamble. By alienating southern African Americans, Roosevelt could have lost a key Republican voting bloc sympathetic to his run, all in an effort to court populist white southerners, who largely voted Democrat. In the general election in November, his calculation went exactly opposite. 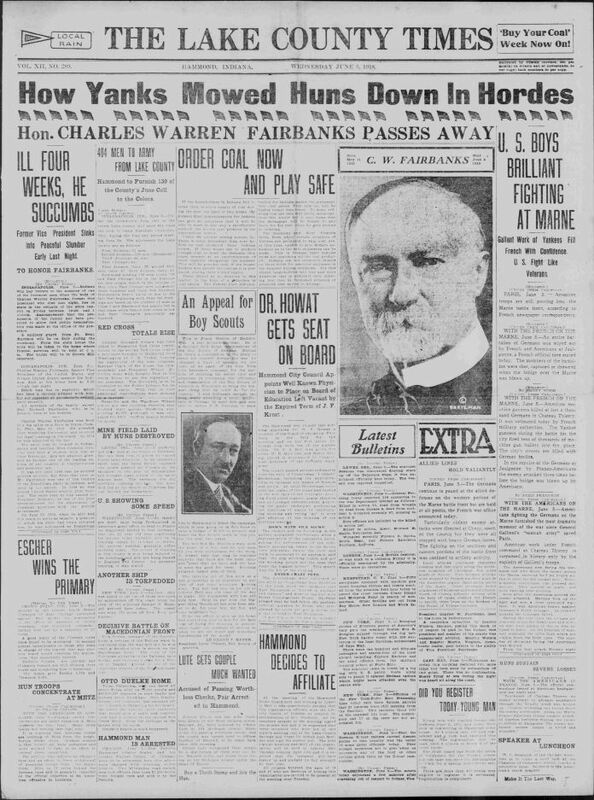 The front page of the Lake County Times, November 6, 1912. Democratic candidate Woodrow Wilson and his running mate, Indiana Governor Thomas Marshall, won the election in an electoral landslide. Courtesy of Hoosier State Chronicles. 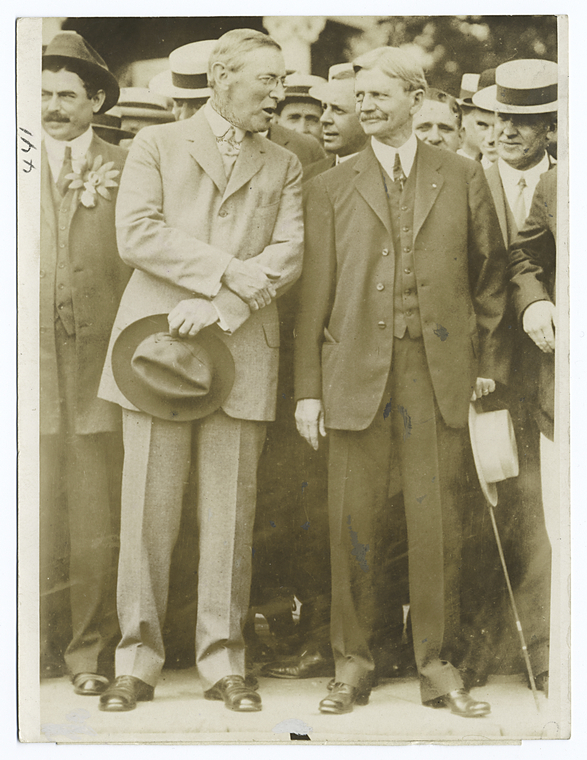 Woodrow Wilson (Left) and Thomas Marshall (Right). Courtesy of the New York Public Library. In the 1912 general election on November 5, Woodrow Wilson, the Democratic nominee, won the election in a landslide, with 435 electoral votes and 41.8% of the popular vote. (Wilson’s running mate was Indiana Governor Thomas Marshall; they won the state with 43.1 percent.) Now, you may wonder: how was this a landslide? It came down to split of the Republican voting base. Roosevelt won 27.4 percent of the popular vote and 88 electoral votes while Taft won 23.2 percent of the popular vote and eight electoral votes. However, Roosevelt did end up winning a plurality of the African American voting base, but did not win the southern populist whites he had courted during the election. 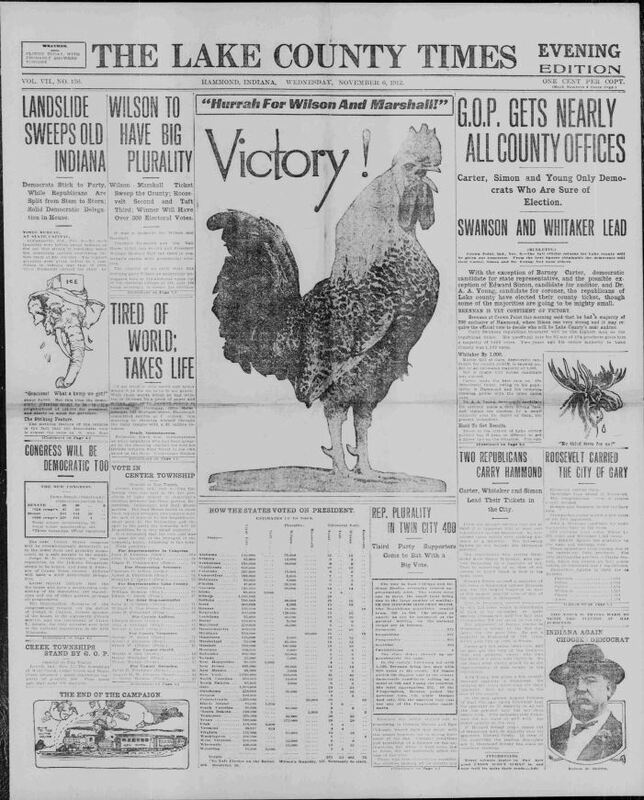 Wilson garnered their vote, and in turn, won the election with a clear victory. A rather sardonic editorial in the Lake County Times on Roosevelt’s loss. Courtesy of Hoosier State Chronicles. Amid the toppling wreckage of the republican party [sic], with its historic pile crumbled into unrecognizable fragments there strides the Modern Apostle of Discontent the Arch-Egoist Theodore Roosevelt. He gazes around him on the debris with a grin and with triumphant staccato simply says—DEE-LIGHTED! ! ! This sentiment underlined what many Republican voters felt about Roosevelt’s decision to run under the Progressive banner: it had only split the party in his vain attempt to take back the reins of power. 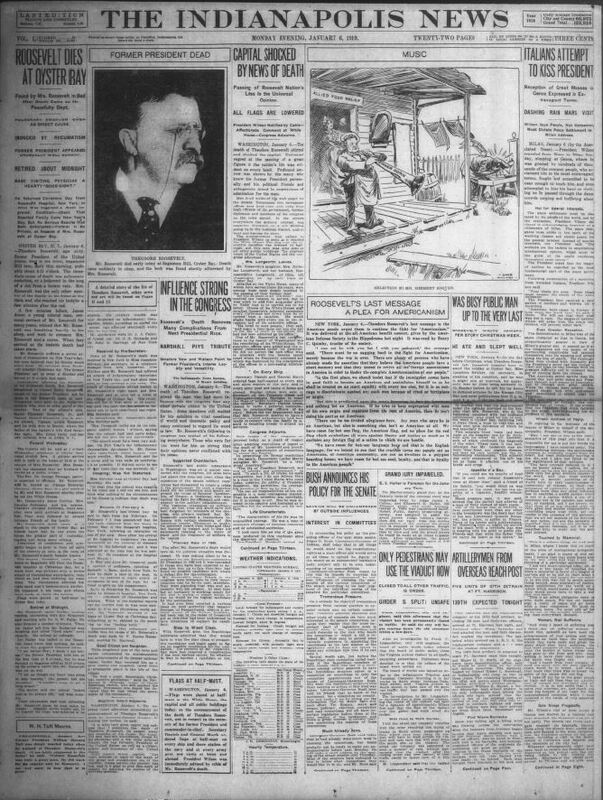 The front page of the Indianapolis News on the day Theodore Roosevelt died. Courtesy of Hoosier State Chronicles. Roosevelt’s chances for a third-term never materialized again, despite his continued political ambitions. He died in his sleep on January 6, 1919, likely from a pulmonary embolism. 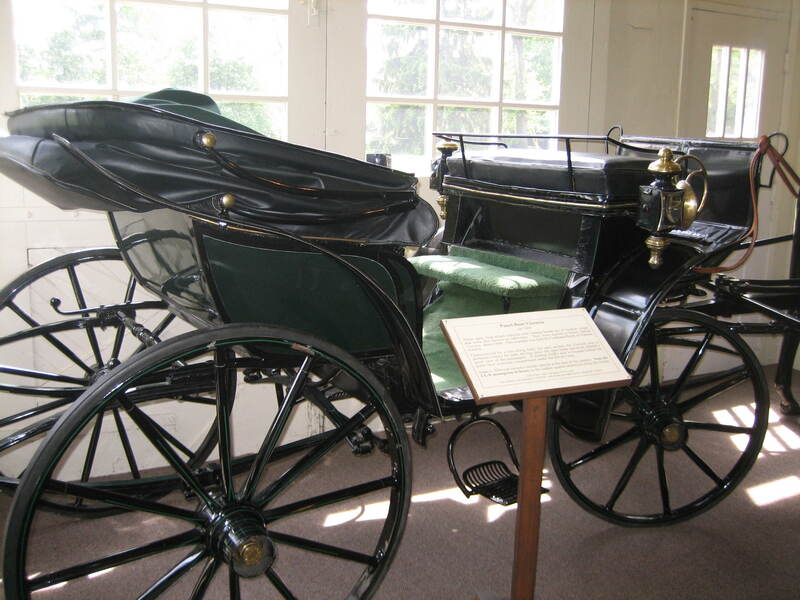 Vice-President Thomas Marshall was once quoted as saying that, “Death had to take him sleeping . . . if Roosevelt had been awake, there would have been a fight.” Marshall also attended Roosevelt’s funeral, and many positive reflections were published in the Indianapolis News. Roosevelt’s political gamble against southern African-Americans cost him both the chance at the election and diminished his reputation as a champion of progressive ideals. Nevertheless, as Gould as argued, his third-party candidacy helped realign the political forces of the country, solidifying the Republican Party towards a more business-centric conservatism while the Democratic Party moved towards a progressivism that culminated in Theodore’s cousin, Franklin Delano Roosevelt, and his “New Deal.” So, beyond just the electoral success, Roosevelt’s complicated third-party challenge influenced the political landscape for decades. President Grover Cleveland. Wiki Commons. In the midst of the fight for repeal of Free Silver coinage in 1893, Cleveland sought the advice of the White House doctor, Dr. O’Reilly, about soreness on the roof of his mouth and a crater-like edge ulcer with a granulated surface on the left side of Cleveland’s hard palate. Samples of the tumor were sent anonymously to the army medical museum. The diagnosis was not a malignant cancer, but instead an epithelioma. Cleveland decided to have surgery secretly, to avoid further panic that might worsen the financial depression. The surgery occurred on July 1, to give Cleveland time to make a full recovery in time for the upcoming Congressional session. Under the guise of a vacation cruise, Cleveland and his surgeon, Dr. Joseph Bryant, left for New York. The surgeons operated aboard the Oneida, a yacht owned by Cleveland’s friend E. C. Benedict, as it sailed off Long Island. The surgery was conducted through the president’s mouth, to avoid any scars or other signs of surgery. The team, sedating Cleveland with nitrous oxide and ether, successfully removed parts of his upper left jaw and hard palate. The size of the tumor and the extent of the operation left Cleveland’s mouth disfigured. During another surgery, Cleveland was fitted with a hard rubber dental prosthesis that corrected his speech and restored his appearance. A cover story about the removal of two bad teeth kept the suspicious press placated. 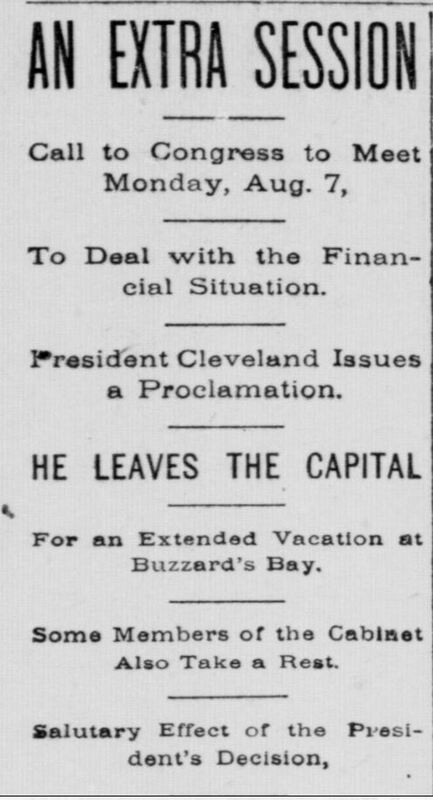 Even when a newspaper story appeared giving details of the actual operation, the participating surgeons discounted the severity of what transpired during Cleveland’s vacation. 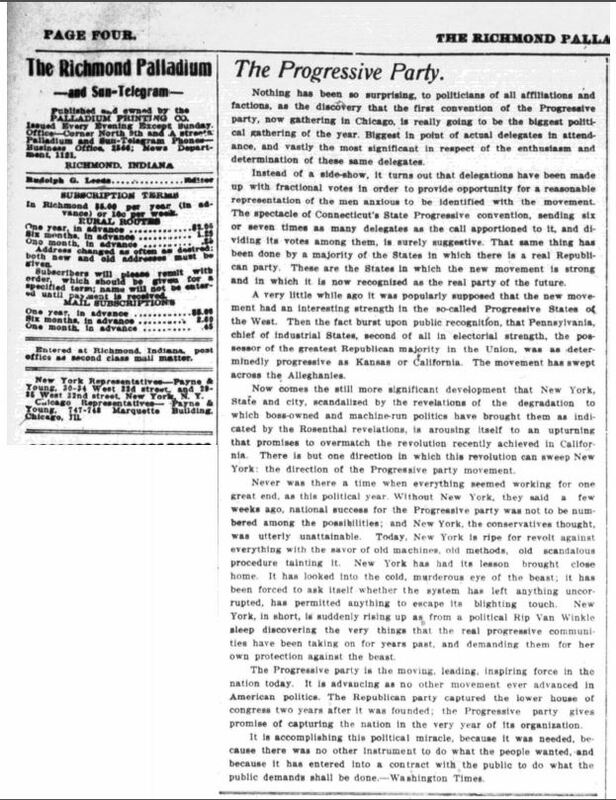 In 1917, one of the surgeons present on the Oneida, Dr. William W. Keen, wrote an article detailing the operation. Cleveland enjoyed many years of life after the tumor was removed, and there was some debate as to whether it was actually malignant. Several doctors, including Dr. 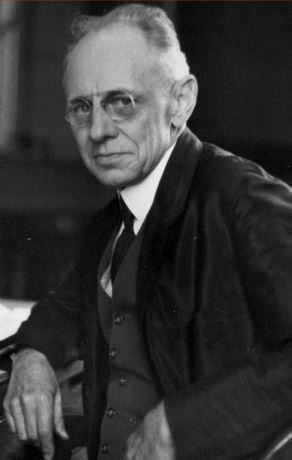 Keen, stated after Cleveland’s death that the tumor was a carcinoma. Other suggestions included ameloblastoma or a benign salivary mixed tumor (also known as a pleomorphic adenoma). In the 1980s, analysis of the specimen finally confirmed the tumor to be verrucous carcinoma, a low-grade epithelial cancer with a low potential for metastasis. 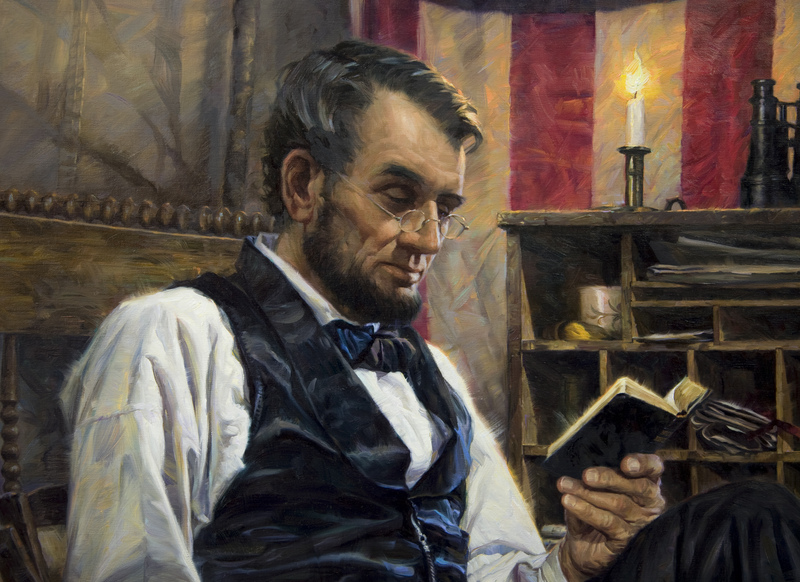 President Abraham Lincoln. Nathan Greene Studio. 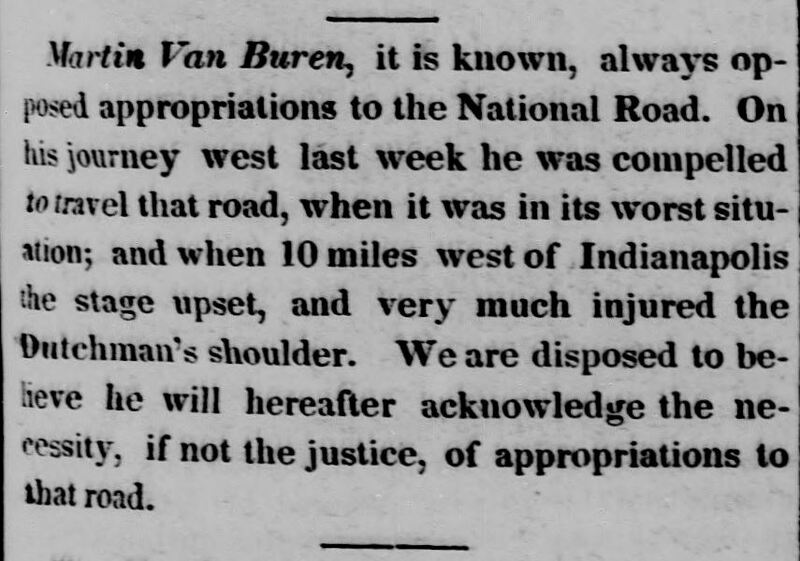 Indianapolis Journal, September 6, 1872. Hoosier State Chronicles.